There is the old adage: The reward of doing your work is more work. I slog through 50 states worth of quarters (with an added bonus of a few of our imperial properties), and what does the mint do? Back up a truck with more quarters. This time, we're not talking about states per se. No, this is the America the Beautiful series, which gives each state a second chance at self-promotion, but this time with a stated topic: National Parks or National Sites (in case your state doesn't have a National Park) or National Forests (if you're really hurting). And I, for one, am of two minds about covering all this. I'm thinking we're looking at eleven years worth of mighty vistas and scenic views. And I wonder if the Internet will still be around by the time I get to the end of it. On the other hand, the previous guided tour through America's coinage was so much fun. How does Arkansas rate as the first quarter? I mean, Yellowstone is the FIRST national park. But Hot Springs was made a federal reservation back in Andy Jackson's time, though no legislation was passed to protect it and a bunch of people claimed it before the feds moved back in and chucked out all the squatters in 1877. So when the national park service was founded in 1916, Hot Springs moved over to that department, and in 1921 it became the eighteenth (and smallest) national park. But it was still "founded" way back. Yeah, it feels like we're splitting hairs here to me, too. 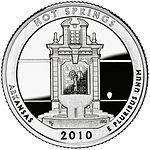 The Hot Springs quarter depicts the first Dancing Water fountain outside Vegas. No, sorry, it actually a fountain in front of a facade of one of the buildings. Not quite sure if the fountain depicted is in front of the doorway depicted or not, which takes it perilously close to my pet peeve of throwing a bunch of stuff on the coin in hopes something sticks. But this one excavates itself with a nice balance. OK, not an auspicious start to a series about the Beauty of America, but maybe we'll appreciate it better after we get tired of all the mountains and forests that are coming up. And to be honest, the design is pretty solid, and how are you going to show a lot of hot water, anyway? And here's a general question - if we've known all such places like this, with superheated water and other volcanic tell-tales, why are we surprised to discover that there is an earthquake fault running up the middle of the country? But that is incidental to this quarter. Wyoming seems to have gotten the memo - their previous state quarter had all the soul of a video game slug and all the deep artistic vision of a mudflap. This time out, they put the pieces together nicely, even if it means parking a bison over the warm, muddy earth of Old Faithful. This is a good quarter, and one that you're going to have a hard time confusing for some other wild outdoor scene. Being early in the sequence this time, they get first dibs on the american buffalo, which I believe is now the most popular mammal on our coins after mankind. So here's one of the challenges to running through the states a second time - what happens when you shot off your big guns the last time around? The previous California quarter was a testament to John Muir (who photographed Yosemite), Half-Dome (at Yosemite), and the California Condor (who was ... um ... vacationing near Yosemite). Now with this new coin we're back at Yosemite again, but this time with a shot of El Capitan, the biggest block of granite in the world. And here I already made my Star Trek joke about Kirk climbing El Capitan in Star Trek V: Please Make the Hurting Stop. Seriously, they deserve bonus points for NOT showing Spock in a levitation harness mocking a climber. But they did do more than just show a big block of rock, with foreground, middleground, and background pieces. On the other hand, we're three coins in and we're already looking at repeats? Would the natives of Los Angeles riot if you put the Golden Gate on this one? Another repeat, though like Yosemite coin, it is an improvement over the mishmash of images from the first try. Almost as if the state quarters were rough drafts for this second set. I think this one is my favorite of this year's crop. I like the sense of depth it gives as the canyon snakes into the distance. Plus, it is a part of the canyon you don't see from the normal vistas. I really want to see how its texture feels when it is released. A good carving can really make a coin like this come alive. Well, here come the mountains, at least. I'm probably going to get tired of them by the time we get the end of it all, and there will probably be a quiz or something. Why Mount Hood? 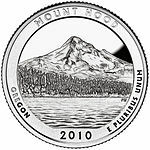 Well, because they put Crater Lake on the State Quarter and, unlike Arizona, couldn't figure out a good way to bring it back for one last curtain call. So we see the majestic Mount Hood, surrounded by the living barrier of killer pine ents which are used to keep tourists from Washington State from climbing it. Unlike the California coin, it is just a vista without anything in the foreground, which actually leaves it feeling a little empty. That wraps the first batch - a couple promising ones, and no real clinkers. It's an OK start. So with all the updating on secret Conservation Illuminati voting, I haven't had much of a chance to plug the upcoming Family Games: the 100 Best, edited by James Lowder. Here's the list of worthy authors and subjects - see how many of each you recognize. 6. Keith Baker on Bang! 25. 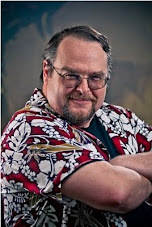 Robert J. Schwalb on Dungeon! 38. Matt Leacock on Go Away Monster! 47. Ed Greenwood on Hey! That’s My Fish! 84. Hal Mangold on Sorry! 87. Andrea Angiolino on Survive! 89. Dan Tibbles on Time’s Up! My contribution: Eurorails (and the Mayfair train games in general) comes out of the fact that my wife and I have played a lot of them over the year, and it was great to tell other people about them. Update: Went through and boldfaced the games I've played over the years. What strikes me about the list is how interesting the pairings are - reviewers are definately going with favorites that feel outside the expected comfort zone. And now I have this desire to play "Hey, That's My Fish!". All of our readers in King County are cordially invited to engage in a secret election tomorrow. There is an election for the King County Conservation District. This is a large organization that advises on land use in rural King County - things like putting more subdivisions in and protecting wetlands. Pretty important stuff, but it doesn't rate inclusion in the general ballot. Answering the obvious question: Apparently, it doesn't rate because it has to pay for inclusion on the ballot, and that would be too expensive. Better to run a little election where no one is paying attention. Answering the next obvious question: Yeah, I guess it DOES mean that we're paying for all those lame Tim Eyeman initiatives that show up every year complaining about government waste. Go figure. Anyway, back to the main point. On Tuesday, there will be an election for the open position on the five-person board. And no, you didn't miss a mail-in ballot. Instead, you have to go vote in person. And, better yet, there are only SEVEN secret locations in the county you can vote. Yeah, its like a scavenger hunt, or one of those Alternate Reality Games, but this time with Democracy (next time, I understand, you'll only get to vote if you bring a policeman's helmet). Actually, this year, the Seattle Times has been paying attention to the election, as have sites like Publicola. But this is Democracy on the sly, the late-night vote, the conversation in the cloakroom. The best thing I can recommend is that you HUNT down the nearest location of the voting and GO VOTE. That'll show them. Oh, right, recommendations. All of the candidate statements are here: I have nothing beyond that a couple recommendations. Those candidates who use the code phrase "Property Rights" usually lose me right off the bat. (1) Of the survivors, I will recommend Max Prinsen though I like Kirk Prindle's concern about over-engineered solutions. So hunt down your secret ballot box and go secretly vote! (1)While property rights are usually presented as "You should have the right to put a pig farm on your property", it usually turns into "Your neighbor should have the right to put a pig farm on HIS property. And then move, because who wants to live near a pig farm?" Update: Went to the Bellevue Library at noon and the place was packed - 50 people in line. Went back at 3 and there were still 50 people in line (though a different 50), and after I voted there was another 50 behind me. Bottleneck at the license check, but otherwise it took about half an hour and was fairly painless, not counting the loudmouthed bass that was busy scaring the seniors and declaring "If a man doesn't have property rights, he doesn't have anything!". Just this side of electioneering, but they can't afford anyone to stop that sort of thing. I think its time for KCCD to put on its big boy pants and join the general ballot. Update Update: The final vote count was 4232 votes, are which 1772 went to Max Prinsen, the winner. The Bellevue polling station was packed, as was downtown, which ran out of ballots for a while. Burien and Vashon stations were not so much. Hardly voting-in-Iraq sort of uncomfortable but still a push for an enthusiastic electorate. Only I could go to a comic book convention and end up at a parade. And the thing is, most people aren't surprised by this. The Emerald City comic convention was this weekend, and, as for all other ECCCs to date, continued to bust the doors down on attendance, such that I'm going to have to start showing up on Sunday if I'm going to actually get to buy any comics. The ticketing problems of last year were more than readily solved by the convention team, but for most of the day the halls were gridlocked by masses of slow-moving fans and non-moving lines. Next year, I think they should go after the guys with the huge backpacks that move with all the grace of trailer truck carrying a house. But it all went very well, and I touched base with a lot of people that ranged from "I saw them on Friday" to "I saw them LAST Emerald City Comics Convention", and there were a lot of hall costumes slowing things down as well, but at least they were entertaining (favorite - a little girl as Princess Leia, who was posing with some accurate Imperial Storm Troopers). But I got my badge and walked down to the Pike Place market to pick some fresh bread and cheese for the Lovely Bride, and on my way back I was blocked by a parade that wasn't there before. A St. Patrick's Day parade. And of course, I stayed to watch, since I part Irish. Well, Black Irish. Well, Black Forest Irish. But hey, it was a parade, which served the purpose of putting all the bagpiper players in Oregon, Washington, and British Columbia together in one spot for an afternoon. And to the rest of Oregon,, Washington, and British Columbia, all I have to say is ... you're welcome. Actually, the pipers were excellent, and there were other representatives of the Irish culture - wolfhounds, dancers, and DeLoreans, the last driven with gull-wing doors extended. And such regular trusted features as the Seattle Seafair Pirates, atop their chosen vehicle, Moby Duck. And the loudest group was, not surprisingly, the Seattle Sounder fans who brought up the rear. And they were competing with Seahawk fans (yeah, they had their own marching group). Oh, and only Seattle would force a unicycle squad to maneuver uphill. They were cool, too. It was nice, and the pirate cannon prepared me for the return to the convention. And afterward ArenaNet hosted a small meet-and-greet at The Elephant and the Crown. Sorry if you didn't make it. So its a long day, and my feet are throbbing from the walk. But another strange day in downtown Seattle. You'd think I'd get used to it by now.